the fitness of boxing for everyone! Download our ITC Member Form & Waiver and fill it out before your first class. Our Amateur Program is in full swing. Call us for more information! Wear comfortable work out apparel, bring a small towel, water, and clean indoor shoes. Everyone must have their own wraps which are available for $10 at ITC. 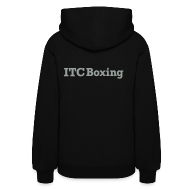 ITC Boxing Fitness Centre has open times for personal trainers, instructors, and similar users that require space for fitness classes, team training, etc. 3000 sq ft, high-impact flooring, clean facility, and a selection of boxing and fitness equipment. Competitive rental prices. Call us to find out more about setting up dryland training for your team!